Substrate: Float glass, clear. Microcorrugation ≤ 20 µm/20 mm. Dimensions: Sizes and glass thicknesses available on request. A cutting tolerance of ± 1.5mm applies to all final dimensions. Angularity: Angular deviations allowed within dimensional tolerance. Edges chamfered as per drawing specifications. 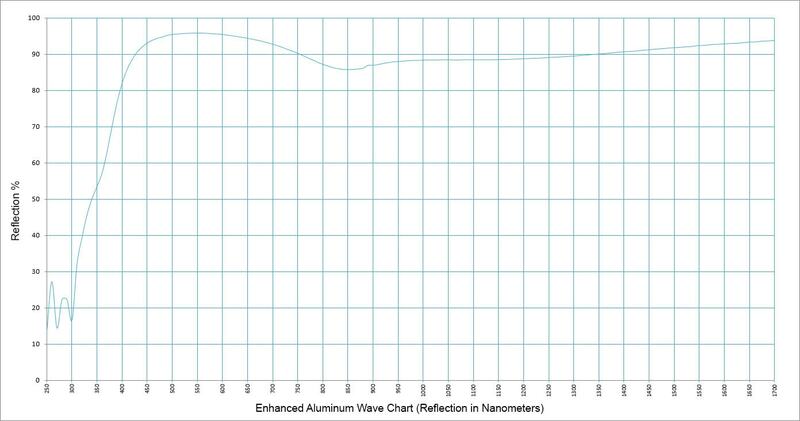 Coating: Single-side coating: Aluminum with an interference coating for reflectivity enhancement, deposited by magnetron sputtering under a high vacuum. No less than 94% reflectivity for the visible region as measured with a Weston photronic cell with a Viscor filter and illuminated by a tungsten lamp supplying light at an angle of incidence of 22.5°. Adherence: No mirror coating will be removed by the cellulose tape test described here. The adhesive side of cellulose tape is carefully placed in contact with a portion of the mirror surface and firmly rubbed against it. It is then quickly removed with an action that exerts the highest possible stripping action. Corrosion Resistance: The mirror has no noticeable deterioration of the finished mirror when given a salt atmosphere in a thermostatically controlled cabinet for 24 hours at 95° Fahrenheit (35° Celsius). The salt atmosphere is created by allowing a stream of bubbles through a salt solution containing 1.5lbs (0.68 kg) per cubic ft of water. Effect of Temperature: The coating is not effected by ambient temperature of -60° Fahrenheit (-51° Celsius)to 500° Fahrenheit (260° Celsius). Hardness: Film is not removed when the following test is applied: Clean dry cheese cloth bearing the force of 1 lb (566 grams) is rubbed against the coating 200 times. Following these tests, the coating does not show any defects such as stains, delaminations, or pinholes The required minimum reflectance values are still exceeded after the tests. Staining: Stains in the coating that are visible in reflected light at a light intensity of 1500 Lux are not allowed. The visual inspection in reflection is performed on a test location with a light intensity of 1500 Lux. For the inspection, the mirrors are positioned in front of a black background. The incidence angle of the light source on the front surface mirror is approximately 30° to the vertical. The coated side of the front surface mirror is toward the observer. Before the visual inspection is performed, the complete surface of the glass is wiped with an alcohol-soaked cloth. The visual inspection for surface defects (scratches, stains) and impurities is performed at a distance of approximately 70 cm. The visual inspection in reflection is performed in a light box with 1500 Lux. The glass panel is placed in the light box so that the front surface mirror is positioned vertically with the coated side toward the observer. The front surface mirror is inspected for coating defects (scratches, pinholes) from a distance of approximately 50 cm.